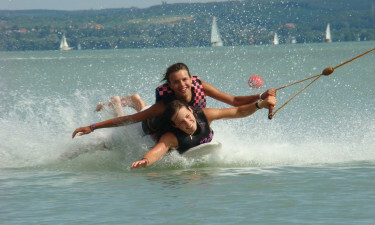 Situated on the edge of the large and lovely Lake Balaton in Hungary, Camping Fuered is the perfect place to stay for lovers of luxury camping. Each mobile home here comes equipped with modern amenities for the whole family to make use of, while the facilities and activities that can be enjoyed right on the site itself are aimed at activity seekers and those who are looking for pure relaxation. Lux-Camp consultants are waiting to help you with your booking. Why Should I Camp at Camping Fuered? 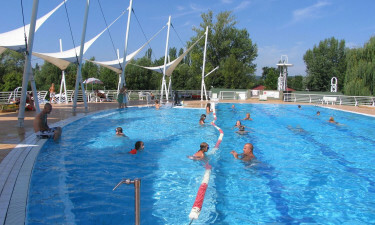 Indoor and outdoor pool complexes. Indulging in a traditional Hungarian meal is a must while enjoying a camping holiday in this part of the world, and the on-site restaurants serve up a number of authentic Hungarian dishes as well as tasty treats from around the world. This luxury camping site also has a snack bar, and a supermarket where guests can purchase ingredients to put together picnic lunches to enjoy on the beach. Lake Balaton is graced with a long stretch of golden sand that can be found just a few metres from this leading Lux-Camp. In addition to spending time soaking up the sun on the beach, families will be able to take part in several different water sports, such as water skiing and kayaking. Families can also let off a little steam at the on-site water park, which boasts a huge network of water slides to zip along, as well as special plunge pools and a large swimming pool that has been designed for guests who want to do some serious swimming.